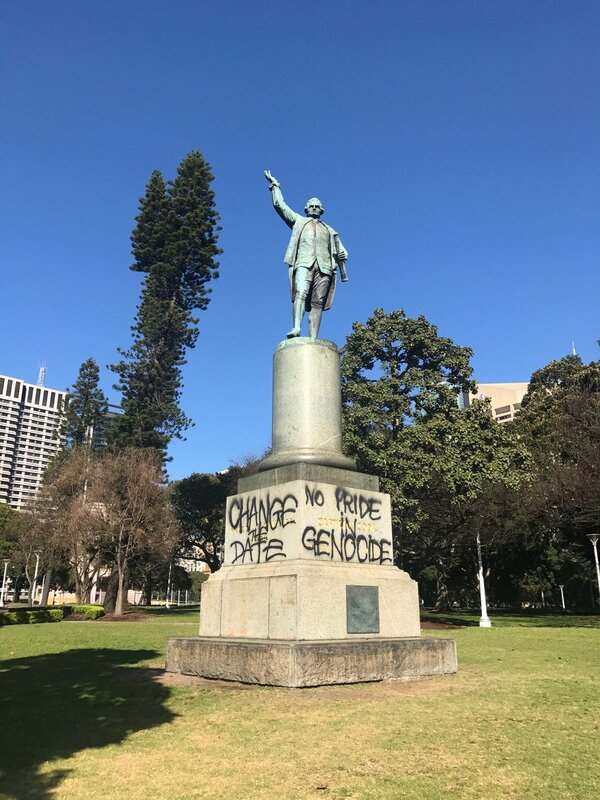 The vandalism of the statues of James Cook and Lachlan Macquarie is a cowardly criminal act and I hope the police swiftly find those responsible and bring them to justice. But it is also part of a deeply disturbing and totalitarian campaign to not just challenge our history but to deny it and obliterate it. This is what Stalin did. When he fell out with his henchmen he didn’t just execute them, they were removed from all official photographs – they became non-persons, banished not just from life’s mortal coil but from memory and history itself. The deeply disturbing and totalitarian campaign which resembles what Stalin did consisted of two spray painted messages, with no structural or permanent damage to the inanimate objects (statues), on which the paint was sprayed. The first message is CHANGE THE DATE. It refers to the proposition that Australia, as a nation, not celebrate its national day on 26 January. The reason is that 26 January marks the beginning of the British invasion, from Tharawhal (Botany Bay), to Gadigal (Circular Quay) and Darug (Parramatta-Hawkesbury) country respectively. The colonisers headed out across the lands of some 350 distinct Peoples. Megan Davis, Cobble Cobble woman and UNSW pro vice chancellor and constitutional law professor (2015-16) describes this as ‘the pattern of killing that was the political economy of Australian settlement’. And as award-winning novelist and Wirlomin Noongar woman Claire G Coleman wrote here, the initial British invasion made way for the attempted genocide of another culture’. The second message is NO PRIDE IN GENOCIDE. It states a simple truth: those who attempt genocide ought not be proud of their genocidal project. This is an incontrovertible moral position, that attempting to wipe out an entire ethno-racial or religious people (a genus, as it were) is a crime against the targeted group and a crime against humanity. According to international law, unjustified invasion (in Thomsian terms, a breach of jus bello) and attempted genocide are war crimes. We are often told that times have changed since 1770, when Cook claimed the east of this continent for the British crown. But this position is confused and misrepresents history. The just war doctrine, generally attributed to Aquinas (1224-1275) was already 500 years old in 1770; and Aquinas derived and distilled his theses from earlier works, as scholars do. What Turnbull does in his social media post is flip a crude binary power relation from perpetrator to victim. He does not draw a parallel between the autocratic, murderous Stalin and the autocratic, murderous Macquarie. Instead, he distorts historical fact to compare a known mass killer to an anonymous individual. The one act referred to is spray painting a statue. It did not hurt anybody. Any body. There are minor inconveniences and clean-up costs, and a sense of indignity or anger among those who are emotionally attached to their dead heroes. But graffiti on a statue is peaceful protest, not a reign of terror. Peaceful protest is where nobody gets hurt, while a reign of terror is where thousands, even millions of people, are killed. Obvious as it sounds, this bears repeating: peaceful protest and mass murder are not the same thing. Analogical overreach is a familiar technique in our public debate. It is used frequently by the white male executive class who dominate all our social institutions. This group struggles to discern historical truth from their own belief in whatever claim they are making, and their act of saying it. Meanwhile, everyone else is compelled to back claims with facts and evidence, and even to justify speaking in public at all (witness the witless conservative response to Michelle Wolf at the White House Correspondents dinner). Comparing graffiti to a fascist dictatorship is a fairly extreme departure from truth, yet there it is, sent out across the digital landscape for anyone to disseminate. The prime ministerial post quoted above was shared 2300 times, and white nationalists are primed to shout FREE SPEECH, whenever we try to call such absurdities in. In this way, a deeply erroneous claim – that representations of dead white men (statues) are of greater import than First Peoples justice and rights – becomes reified. The Prime Minister sets the terms, and public debate is programmed to operate within those terms. Value-laden norms like ‘meeting place’ or ‘discovery’ carry a host of underlying assumptions, even as those assumptions deny or erase the reality of British invasion. May we question such assumptions? Not really. Such assumptions may be questioned or articulated within acceptable parameters laid down by the executive class. It works like this: alternative narratives may be tolerated, but only to the extent that a base line of conformity is not disturbed. Anything that upsets the parameters of debate, rather than offer token balance within it, is loudly derided as identity politics (only dominant white male narratives are endorsed as impartial or objective), and as disrespectful (only dominant white male narratives, no matter how obnoxiously bigoted, qualify as civilised). Those who do question orthodox parameters, such as by promoting Change the Date, are denigrated as ‘divisive’. In this case, calling for a change of date for our national day is labelled cowardly and criminal. The Stalin comparison has another, special purpose. It is designed to create the impression that a graffitist with a spray can is dangerous, and thus to be feared. This is so we may infer that, by defending a stone rendering of a dead Yorkshireman, Turnbull is being brave. It does not take courage to post an illogical analogy on social media. This is something people do every day of the week. There is a scene in the Dickens masterpiece Bleak House starring ex-soldier Sergeant George, beloved by some of London’s poorest inhabitants for the compassion he shows towards them, and as someone who acts on principle. The good soldier must decide whether to hand over a letter written by his late comrade Captain James Hawdon to the lawyer Tulkinghorn and the money-lender Smallweed. The letter is of great value, as it will confirm the identity of Nemo the law writer, who fathered the illegitimate child Esther Summerson to Honoria Barbery, before her marriage to Sir Leicester Dedlock. Such a principle of soldiering is lost on tin pots like Turnbull. Politicians who start and join wars do not risk their own lives, and a commander who risks the lives of the living to recover the dead is making bad decisions. This is so in combat and equally true for commemoration and national narrative. For every $500 million allocated to the Australian War Memorial, or $100 million on a museum in another hemisphere, or $50 million in yet more homage to Cook, there are opportunity costs. These costs are paid by students whose education is compromised, by patients to whom health services are not delivered, by women and children seeking refuge from violent men and who can not get away because there is nowhere to go. What is the ‘benefit’, in return for this extremely high price that some, mostly women and children and always First Peoples, always low income householders, pay with our future, our opportunities, our safety and lives? Well, a white male executive class get to dominate the national narrative in ways that venerate their heroes and at the same time erase thousands of acts of courage, of heroic resistance, of almost inconceivable tenacity and determination and everyday struggle. History is written and re-written by the most powerful and least moral, such that the ‘different times’ argument becomes ever weaker. It is one thing to argue, however uncritically, that Cook himself should be judged by the standards of eighteenth century England. It is quite another to continue to claim honour, for actions which opened the door to invasion and attempted genocide, in 2018. Why not right past wrongs instead? The hundreds of millions of public dollars allocated to just three projects, and just during this Coalition government, are a profligate waste and inexcusable investment in historical inaccuracy. When decolonising knowledge systems, a process rather than an end point, there are four basic principles. Adhering to these principles can prevent the problems of colonial mindsets, where the opposite of knowledge – errors, mistakes, falsehoods, lies – are disseminated instead. The principles are these: knowledge must be place-based; the past co-exists with the present; human cultures are not frozen in time; and anglo- and euro-centric frameworks inevitably produce inaccuracies. Inaccuracy is counter to the purpose, ontologically counter to the existence, of everyone and everything operating in the public domain: universities, journalists, historians, politicians. Inaccuracy is, or should be, a thing we are committed to not doing (or being). For more on decolonising, a detailed exegesis of these four principles here. For many years, First Peoples have campaigned to see Aboriginal and Torres Strait Islander diggers recognised in official military histories. Their distinct identity as Indigenous soldiers has been routinely erased; as well as their specific experience as returned soldiers denied the basic rights of citizenship, including soldier-settlement compensation packages. One valuable project (of many) corrects this record here. It is a predictable and poignant irony that white soldiers were gifted parcels of stolen Aboriginal land while Aboriginal soldiers were doubly – continuously – dispossessed. Similarly, the Australian War Memorial consistently refuses to recognise the Frontier Wars. Aboriginal resistance to the invaders and colonisers is well-documented historical fact and ongoing, for example, the Stolenwealth Games action. This campaign highlighted the illegitimacy of the Commonwealth, a fact belatedly recognised by our highest court Mabo v Queensland (No. 2)(1992) 175 CLR 1, and by the Australian Parliament Native Title Act 1993 (Cth). Re-branding the British Empire, such as from Empire Games to Commonwealth Games, does not make it any more legitimate (the Crimes of Britain site is a handy central online repository). The British Empire enriched itself by plundering the people and lands of places to which it had no right, on every populated continent, as demonstrated by Shashi Tharoor on India, here. There has been no acknowledgement, and no reparations. This alone tells us the resistance is ongoing, rather than a new or discrete action. Re-branding can not and does not change the fact that the Commonwealth is an illegitimate global entity, regardless of what political leaders say at the Commonwealth Heads of Government Meeting (CHOGM). Meanwhile, failed former Liberal Party leader Brendan Nelson, recycled to head a national institution as failed white male leaders inevitably are, accepted the proposition that navy personnel who participate in turning back refugee boats be recognised at the Australian War Memorial. This is in breach of its mission, because we have not declared war on non-state actors who seek asylum in Australia, and no ADF personnel were killed in action. In contrast, many refugees have died under the same Operation Sovereign Borders policy (a recap by Marr, 2014, here). A separate memorial to resistance warriors and the Frontier Massacres has been canvassed (sign the Aboriginal Tent Embassy petition here). It is conceivable that a properly funded institution headed by Aboriginal and Torres Strait Islander people will result in a more accurate telling of invasion and colonisation. It is frankly inconceivable that the establishment of an Aboriginal memorial will be allocated anything like the half-billion dollars Nelson wants, and will probably get, for the AWM. Located in Villiers-Bretonneux in France, this vanity project of deposed conservative prime minister Tony Abbott is riddled with the worst excesses of misplaced military glorification. At the opening ceremony, media and law expert David Marr said ‘the French prime minister, Édouard Philippe, delivered a speech that blew [current conservative Australian PM] Malcolm Turnbull’s to smithereens’. Marr tells us that Turnbull was pedestrian and dull in comparison, which is no surprise to anyone who has observed Turnbull in speechmaking mode. His hallmarks are plodding gravitas, phoney enthusiasm, and ill-concealed anger. That he was eclipsed by Philippe on the day is predictable, because Philippe was place-based, on his home soil. Those soldiers bled into and embraced the earth on the western front in the northern hemisphere, no matter where they were born. Turnbull has no meaningful connection there. This was painfully evidenced when Turnbull, in his speech opening a museum (or ‘centre’. Honestly. The imagination) attributed a pivotal victory led by Brigadiers-General Glasgow and Elliot to the eponymous Sir John Monash. This was picked up by historian Ross McMullen, who alerted us via Fairfax newspapers almost a full week later. All those political advisors, those foreign affairs officials and media staff, and nobody had fact-checked whether Monash led a battle that Turnbull, twice in two days, claimed that Monash had won. Military history is absolutely not my thing, but research is. It took about 20 minutes to locate the primary source in the AWM archives, a letter from Monash dated 26 April 1918. Another quick search produced multiple scholarly and popular accounts of the same battle. This is unsurprising. First, there is the date – it was the three-year anniversary of the Gallipoli landings (25 April 1915) that are now the defining Anzac Day event. Second, there is a near-consensus view that the action was decisive in the lead-up to German surrender (see for example Pedersen 2014, pp. 139-44). It was not difficult to find out that Turnbull had attributed victory to a bystander based at a nearby chateau (sic) who himself noted – in parentheses! – that the battle was led by Brigs-General Glasgow and Elliot (War letters of General Monash, Australian War Memorial, Canberra pp. 398-400: accessed 30 April 2018). [Anzac day was] signalled by a wonderful fight, Monash wrote, carried out by the 13th and 15th Australian brigades – (Glasgow and Elliot) both of which Brigades have been under my orders for the past few weeks. It was the same old story. My 9th Brigade had held securely, and kept the Bosch out of the town of Villers Bretonneux for three weeks. They were then withdrawn for a rest on April 23rd, and the 8th British Division (regulars) took over the Sector from them. Naturally, on April 24th, the Bosch attacked (with 4 Divisions) and biffed the Tommies out of town. Late at night we had to organise a counter-attack. This was undertaken by 13th and 15th Brigades, in the early hours of Anzac day. They advanced 3,000 yards, in the dark, without artillery support, completely restored the position, and captured over 1,000 prisoners. I can see the prisoners pouring past this chateau, from the window of the office, as I write this letter. It was a fine performance. Everything on my front is quiet. Although there has been a lot of talk of another big attack, nothing has materialised. In any case we are quite ready for him. Monash did not lead this decisive battle, but he wished he had. It was the same old story. My 9th Brigade had held securely… Everything on my front is quiet. Turnbull and Abbott, and the edifice they conceived and oversaw, are also completely misplaced at Villiers-Bretonneux in France. Malcolm Bligh Turnbull is descended from, and named after, the least capable colonial leader of his age. Bligh is a man who sailors mounted a mutiny against at sea; and who soldiers mounted a coup against on land. Abbott is British-born and remains British in spirit. For instance, he said to then-tory British prime minister David Cameron, on the world stage, at a G20 meeting, that pre-colonial Sydney was ‘nothing but bush’. In fact, Australia is home to the oldest continuing cultures on earth, a claim explored with nuance by Luke Pearson here. It is a place of successful, subtle and sophisticated societies which have developed – and continue to develop – over 65,000 years. These are societies of intricate laws and vast knowledge of ecology, of astronomy, of the human condition, neatly summarised by journalist and Darumbal and South Sea Islander woman Amy McQuire here. An Aboriginal woman invented bread: Uncle Bruce Pascoe, Bunurong man and author of Dark Emu, the kind of book that changes lives. However, it is not possible to shift Turnbull and Abbott from their anglo-centric, colonial mindset, and as stated above, anglo-centrism produces inaccuracy. The widely discredited ‘great man in history’ method has been discarded from curricula by historians all over the world, but not by conservative politicians. For men like Abbott and Turnbull, the ‘great man’ approach is the only approach. They do not have the range, the depth, to process any other perspective. Learning nothing, our prime minister then returned home and strolled along the Kamay (Port Botany) shoreline with Treasurer and local member Scott Morrison. While the ABC took care to revive the defaced Cook statue story, it did not bother to identify or publish a quote of anyone other than the two white men pictured at the photo op. Prime Minister Malcolm Turnbull says the revamp of Sydney’s historical Botany Bay site, the place of the first encounter between Europeans and Indigenous Australians will allow the country to “celebrate, understand and interpret” the “momentous place” it is. This is so frustratingly wrong, on so many levels. Cook was not a European, he was an Englishman. He lived during an era when Britain was almost constantly at war with continental states like Spain and, most notably, France. There was no announcement about venerating the Frenchman La Perouse, who turned up in 1788 a few days after Phillip and his fleet. This is despite the fact that Turnbull was talking turkey on our ‘shared values’ – whatever that means – with French president Macron at the Sydney Opera House just a few days later. But no: just Cook, at the LaPa site. This matters. The English colonised this place, not ‘Europeans’. There is no valid reason for continental Europe to share responsibility for the crimes of the English and their band of British collaborators, like the Scotsman Macquarie. The English did not identify as European then, and despite the best efforts of more progressive thinkers, do not now. This is evidenced by Brexit and the Windsrush generation as I write. Kamay, or Botany Bay, was not the first encounter between Europeans and Indigenous Australians, either. Upwards of 300 distinct peoples are not a homogenous category of ‘Indigenous Australians’. Creating this homogenised category erases the diversity and identity of hundreds of Peoples, their language groups, landscapes, societies and laws. Returning to the anglo-euro perspective, famous prior ‘encounters’ include the 1629 wreck of the Batavia off the west Australian coast, where two white men were put ashore as punishment for murders there. The Torres Strait is named after the 1606-08 voyage of Luis Váez de Torres. The Tasman sea and Tasmania itself are named for the 1642 claim to the island staked by Abel Tasman. Unlike Cook, these men were Europeans, but that does not mean their names and claims had – or have – any validity, for the simple reason that the continent and her islands were already occupied by First Peoples. In typical English fashion, like the Parthenon marbles stolen and retained by their ruling classes, the British Museum refuses to return the Gwaegal Shield, which bears the bullet holes and which belongs to the descendants of those warriors who Cook attacked. The museum can not do justice to the shield, because the past co-exists with the present, because anglo-centrism produces inaccuracies, and because knowledge is place-based. This is a momentous place. One we need to celebrate understand interpret and reflect on. Kamay is a momentous place. It is a place of great moment, a moment that opened the way to invasion and changed the course of 65,000 years of human occupation here, for every Aboriginal descendant since. It is not, however, a moment we need to celebrate. This is a place of commemoration, not celebration. The Cook claim, English invasion, British colonisation, and attempted genocide: these are not causes to celebrate. As the anonymous spray painter made clear, in that act of peaceful protest which did not harm anybody, there is NO PRIDE IN GENOCIDE.